Q. 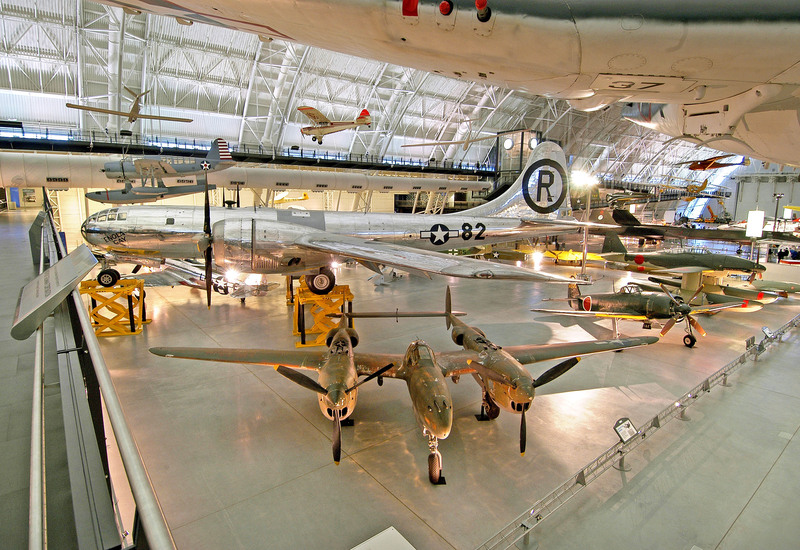 Why is the B-29 Superfortress Enola Gay among the artifacts displayed at the National Air and Space Museum's Steven F. Udvar-Hazy Center? "The National Air and Space Museum shall memorialize the national development of aviation and space flight; collect, preserve, and display aeronautical and space flight equipment of historical interest and significance; serve as a repository for scientific equipment and data pertaining to the development of aviation and space flight; and provide educational material for the historical study of aviation and space flight." The National Air and Space Museum tells the story of the development of flight and chronicles the history of the technologies that have made flight possible. Q. How is the B-29 Superfortress Enola Gay exhibited? A. The design for exhibitry at the Udvar-Hazy Center is unique, best described as enhanced open storage. Each aircraft or large space artifact is displayed with an individual label and grouped into sections providing historical context. The Enola Gay rests on three eight-foot-high stands to enable viewing from various levels and for the display of smaller aircraft below the airplane's wings. Boeing's B-29 Superfortress was the most sophisticated propeller-driven bomber of World War II, and the first bomber to house its crew in pressurized compartments. Although designed to fight in the European theater, the B-29 found its niche on the other side of the globe. In the Pacific, B-29s delivered a variety of aerial weapons: conventional bombs, incendiary bombs, mines, and two nuclear weapons. This type of label is precisely the same kind used for the other aircraft and large space artifacts in the Udvar-Hazy Center. Its intent is to tell visitors what the object is and the basic facts concerning its history. Throughout its existence, the museum has carefully followed an approach that offers accurate descriptive data, allowing visitors to evaluate what they encounter in the context of their own points of view. Q. Why is this particular aircraft representing B-29s in the national collection? A. Our goal is to collect artifacts that have maximum exhibition potential by virtue of their rich histories. The Enola Gay was used to carry out the first atomic bomb mission and is perhaps the best-known aircraft from World War II. The B-29 is an extraordinarily important aircraft from a design and manufacturing point of view, and from a general combat operational perspective in World War II. There is no story about the B-29 or World War II that you cannot tell with this particular airplane. The Enola Gay has been in the Smithsonian collection since 1949. Only 30 B-29s still exist and 25 of those are in museums. Of the 15 B-29s built for atomic bombing missions, only two still exist--Enola Gay and Bockscar, which is displayed at the National Museum of the United States Air Force in Ohio. Q. Why did the National Air and Space Museum restore the Enola Gay? A. The primary responsibility of a museum is to care for its collection. Although this artifact is 99 percent original, it had to be disassembled and was in very poor condition after being stored outdoors for several years. Therefore, a decision was made to restore it as fully as possible. This was completed in-house over ten years as resources were made available. Other museum aircraft have also been restored for the Udvar-Hazy Center, including the Japanese bomber Aichi Seiran, and the 707 Prototype "Dash 80" and the 307 Stratoliner, which were restored to flying condition by the original manufacturer, Boeing. Q. How is the Enola Gay treated in education programs for youngsters? A. In describing the artifact in general education tours, designed for grades 6 through 8, the museum's education staff provides background on the aircraft, its use in the Hiroshima mission and the B-29's role in World War II and Korea. Q. Why isn't the B-29 being exhibited in the museum's flagship building on the National Mall? A. A B-29 is too large to be displayed fully assembled at the Mall building. Portions of the aircraft were displayed downtown in the 1990s but the aircraft could only be reassembled fully in the kind of space provided by the Udvar-Hazy Center aviation hangar. Q. Are films, video presentations or publications specifically related to this artifact at the Udvar-Hazy Center? A. Over time, the museum is adding interactive components to displays at the Udvar-Hazy Center and historic footage involving Enola Gay has been included in the development of hand-held interactive guides. The airplane is also a subject in several books for sale in the museum store at the Udvar-Hazy Center. Q. As one of the most famous artifacts in the museum's collection, has the Enola Gay been the subject of any special programs? A. In October 2004, the Udvar-Hazy Center hosted a National Air and Space Society lecture by Enola Gay pilot Paul Tibbets and crew members Theodore Van Kirk and Morris Jeppson. The three men discussed their Hiroshima mission and other World War II bombing operations in the European and Pacific theaters. Q. What do you say to those who believe this display of the aircraft glorifies nuclear war? A. The exhibit plan at the Udvar-Hazy Center, including the Enola Gay label and text in its section, does not glorify or vilify the role this aircraft played in history. We invite the public to come and see the exhibition and share its impressions with us. Many aircraft--American and from other nations--associated with major military actions are in our collection and can be found at the Udvar-Hazy Center and in the Mall building's galleries on World War I, World War II, etc. Q. What was the total cost to restore the Enola Gay? A. It is impossible to calculate this because restoration occurred as time and labor were available. Many of the more than 300,000 estimated man-hours were volunteered. Q. What is the legacy of the B-29 Enola Gay? A. In the end, the Enola Gay played a decisive role in World War II. It helped bring the war to an end in that after the bombing of Nagasaki, shortly after the bombing of Hiroshima, Japan, surrendered unconditionally. But perhaps more critically, it profoundly affected our concept of major conflict and the importance of maintaining global peace. In addition, the Enola Gay, as a B-29, was the most technically advanced aircraft ever flown for its time. The crew was protected by pressurized environments, and the craft carried enormous bomb loads over a tremendous range. The B-29 was the mainstay of American nuclear deterrent capability early in the Cold War. The B-29 Superfortress Enola Gay, with a P-38J Lightning, foreground, in the World War II section of the Boeing Aviation Hangar at the National Air and Space Museum's Steven F. Udvar-Hazy Center.